When the Houston Rockets won the NBA championship in 1994, revelers piled into their cars and drove back and forth past the bars and nightclubs on Richmond Avenue. It was an odd choice, but back then there were few spaces where Houstonians could come together to celebrate. The city has grown up over the past couple of decades, though. Thanks to some visionary residents and a new mindset, public spaces where citizens can gather to honor, remember, exult, and protest are proliferating. Space City may once again be worthy of its name. The launch of the new Glassell School of Art near the corner of Montrose Boulevard and Bissonnet Street in the Museum District is a most promising sign. Like the great museum designers around the world, the Glassell team figured out that it makes good sense to become a people magnet. At a press preview, in fact, officials from the Museum of Fine Arts, Houston seemed as tickled by their new public space as they were by the new building itself. There’s the large open courtyard, with dancing fountains that welcome children who may be a hot mess. There’s the much-talked-about “Cloud Column” sculpture by Anish Kapoor, fast becoming a destination spot for photos. There’s an outdoor amphitheater for movies and other events, and a rooftop garden with breathtaking views in all directions. “We can’t wait to see families climbing the roof to enjoy the view,” MFAH board chairman Rich Kinder said at an opening event for the space. Kinder and his wife, Nancy, deserve much of the credit for the city’s new wealth of public-gathering spaces, including the Glassell's. They spearheaded Discovery Green, the wildly popular 12-acre park downtown that opened in 2008. That too offers family-friendly fountains, plus playgrounds, a bandstand, and a performance stage. 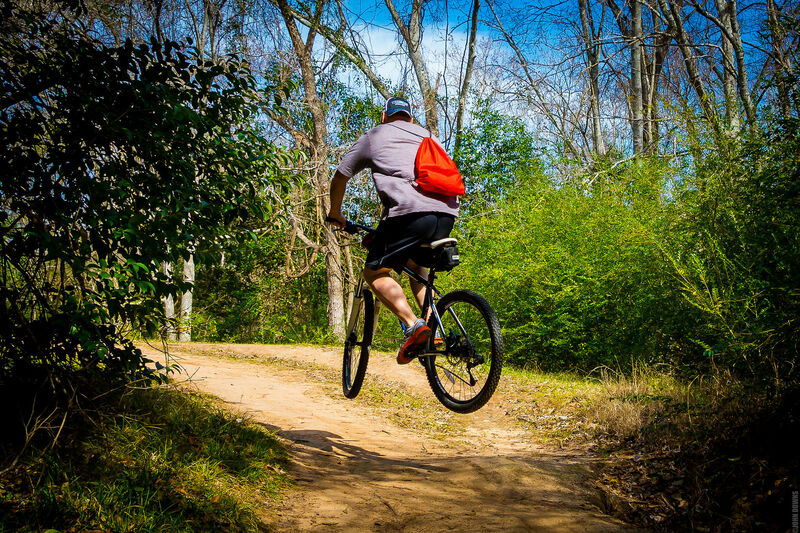 We need places where people can gather and experience the outdoors. 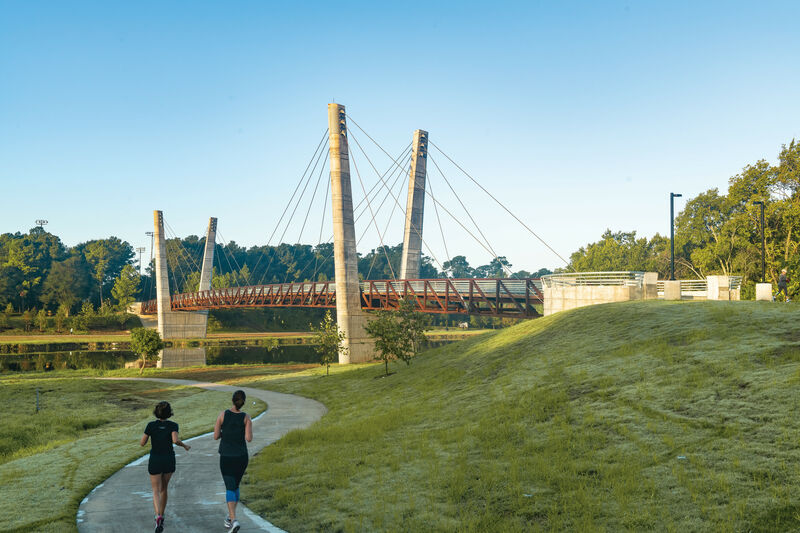 The philanthropic couple also were the driving force behind the magnificent upgrade of Buffalo Bayou Park, with its elevated skylawn and pavilion, the Water Works. And they recently donated $70 million to fast-track crowd-friendly improvements to Memorial Park. One Houstonian, reflecting on the struggle to renovate Jones Hall downtown, joked that “maybe they should put a green space on the roof” to attract the Kinders’ attention. The array of new spaces has added a level of sophistication and a touch of loveliness to a city long derided as ugly. When bidding for the 2012 Summer Olympics, Houston was the first of the final contenders to be dropped, largely because of the perception that the city was so unattractive. Such events have spurred city officials and private citizens to come up with long-term plans to upgrade parks and create new gathering spots. But even before that, a growing number of local developers were snapping to the fact that linking projects to public spaces made business sense. Case in point: The Gerald D. Hines Waterwall Park adjoining Williams Tower near the Galleria. When developing what was then called Transco Tower in the early 1980s, Hines added a private 2.77-acre park featuring a 64-foot architectural fountain that became a prime Galleria attraction. Hines later donated it to the city as a public park. More recent examples include Midtown Park and Bagby Park, both public-private partnerships designed to serve as community spaces near the apartments and mid-rises of Midtown. 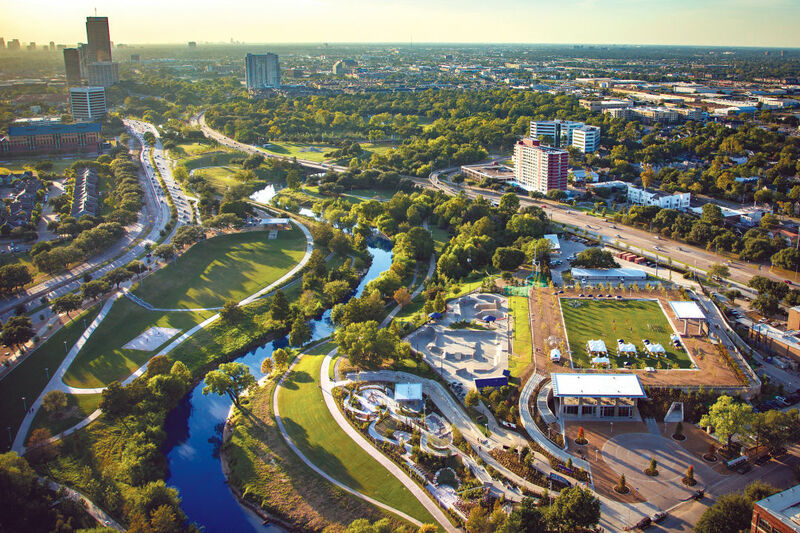 And Discovery Green, carved from a swath of paved parking lots on the then-unfashionable eastern part of downtown, has spurred tremendous development in the past decade: apartment towers and restaurants and big hotels that tout the greenspace to lure out-of-towners. “One thing builds onto another,” said Jefferson Duarte, a professor of real estate finance at Rice. Regardless of their origins, the best spaces take on their own roles in city life. Hermann Square at City Hall, dominated by a sparkling reflecting pool, is a natural gathering spot for communal celebrations—and protests. The Astros drew upward of a million people last year for a celebration that culminated there, and the Houston Women’s March and the Houston Youth Walkout peacefully assembled in the same spot to call for equitable treatment of women and changes to gun laws. 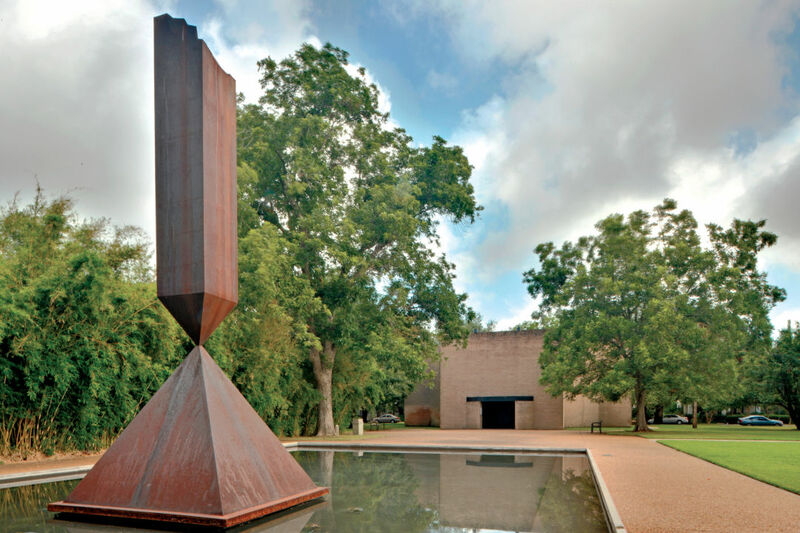 The Rothko Chapel’s mission of spiritual reflection and advancing social justice, meanwhile, makes its outdoor plaza and Barnett Newman sculpture, “Broken Obelisk,” a natural destination on World AIDS Day and Martin Luther King’s birthday. The new public space at the MFAH's Glassell School is already a popular spot for photos. The new Glassell School, officials say, aims to play a role similar to the one filled by Discovery Green: as an old-fashioned civic space where all generations can enjoy themselves. 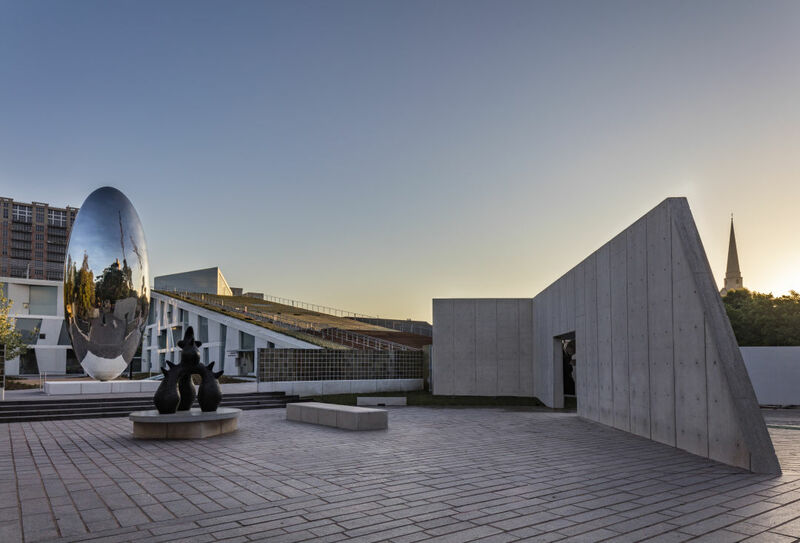 “We hope Houstonians will quickly grasp that our project intends to be a new destination for the city,” MFAH director Gary Tinterow said at the opening event for the Glassell. 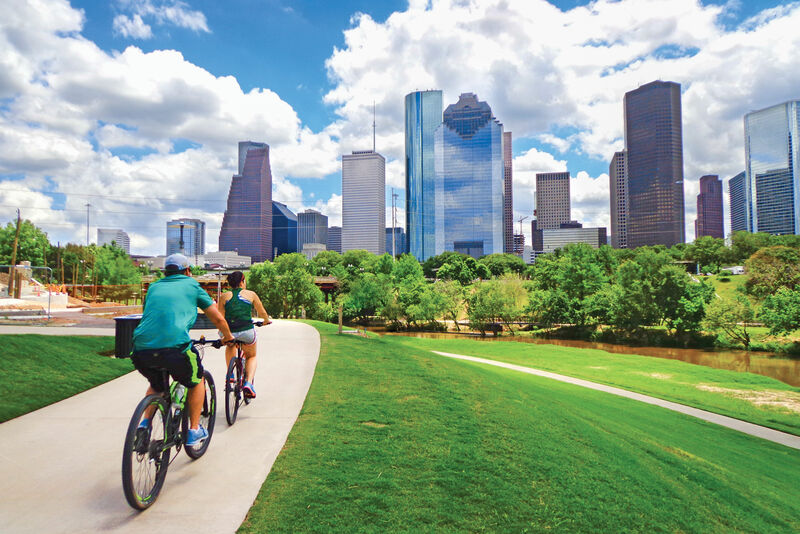 Though such spaces are familiar in the humblest villages and grandest cities around the world, crafting a beloved gathering spot has not always been a slam dunk for Houston. Despite numerous costly attempts to lure people to Jones Plaza in Houston’s Theater District, the 1.5-acre space remains largely vacant. A $6.5 million redo of the plaza, back in 2001, unveiled a large fountain, crushed granite walkways, concrete benches, space for a restaurant, and a performing space. But the plaza has mainly drawn attention for its green tiles, which make it look like a bus station bathroom. Now plans are in the works for another redo, this time costing $25 million. The new plan, from the Los Angeles design firm Rios Clementi Hale Studios, calls for an open lawn and shade trees, along with a two-story indoor-outdoor dining space. It is scheduled to open in 2020. Only time will tell whether it becomes another transformative Houston public space.